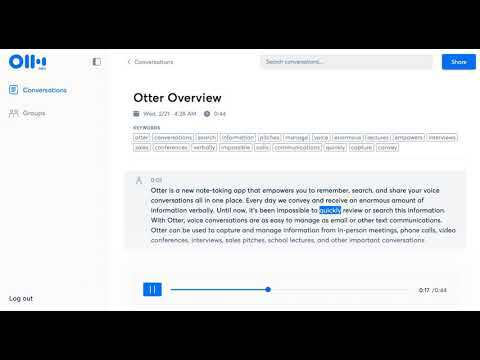 Lifehacker has a review of a new audio transcription app, Otter Voice Notes, that uses artificial intelligence to transcribe audio in real time. Audio transcription is good for interviews, oral history projects, lectures, and meetings. Although the AI transcription is not perfect, this app has the benefit of being free or relatively cheap to use and more accurate than other AI transcription apps. This entry was posted in tech tips and tagged android, apps, iOS, transcriptions. Bookmark the permalink. Thank you for posting this! On and off through the years I’ve been looking for an affordable (preferably free) transcription service. The closest I’ve gotten was Google Voice’s transcription of voicemails. That caps off somewhere around two minutes. I would break up podcasts into two-minute segments and send them off to Google Voice. I will gladly try Otter Voice.